Is this visitor's dog showing signs of constipation? See what the Dog Expert has to say. Problem: Is Dog Showing Signs of Constipation? Last night my Maltese was acting very weird. He normally sleeps on my mom's bed, but last night he was yelping and pacing back and forth on the end of her bed. We let him outside, but he would just walk right back in. He did this all through the night and still seems a little different this morning. We have an alarm system and all our doors were locked, so I don't think anyone was in our house. Lastly, when I went to pick him up last night his stomach was very tense, and if I tried to make him walk, he would walk a few feet and then sit down. I just want to know if I should take him to vet or if we should be expecting more nights like this one. It's possible that your dog heard something outside of your house, but I really think this is a physical problem. When we consider the main symptoms of an unusually firm belly, difficulty walking and whimpering, it leads me to believe that your dog might have a blockage of some sort along the intestinal tract. The block could be in the upper intestinal track, which would explain why your dog wasn't going at all, or it could be a simple case of constipation. Either way, I think this is worth a trip to the vet. 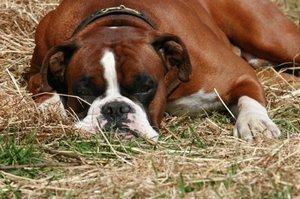 Your vet should be able to quickly diagnose the problem and help your dog from there. Thanks for your question, and I hope everyone's having sweet dreams again soon.